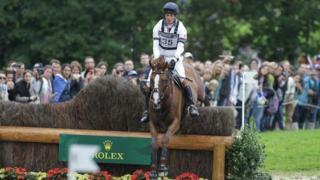 World number one William Fox-Pitt and his horse Chilli Morning put on a master class in the cross-country to lead the eventing competition at the World Equestrian Games. Fox-Pitt narrowly leads German Sandra Auffarth, with Great Britain second in the team event. But there was also distress for the British team when Wild Lone, ridden by Harry Meade, collapsed and died after Saturday's competition.